Please don't kick innocent robot dogs! Researchers at ETH Zurich in Switzerland taught a four-legged robot dog a valuable life skill: how to get up again after it gets knocked down. And yes, it involved evil scientists kicking and shoving an innocent robot. 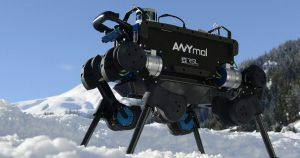 The researchers used an AI model to teach ANYmal, a doglike robot made by ANYbotics, how to right itself after being knocked onto its side or back in a variety of physical environments — as opposed to giving the robot a detailed set of instructions for only one specific environment. The results were published in a paper today on Science Robotics. In simple terms, the robot tried again and again to right itself in simulation, and learned from instances when a movement didn’t end up righting it. It then took what it learned and applied it to the real world. It even learned how to run faster than it could before. Thanks to the neural network, ANYmal was also able to reach 1.5 metres per second or just over three mph in mere hours, according to New Scientist. Are we inching closer to a future where robot guard dogs chase us down to exact revenge on us, as seen on Netflix’s Black Mirror? Sure looks like it. So perhaps it’s time to stop kicking robot dogs — before we know it, they’ll start learning how to protect themselves.